This story was originally published on June 9, 2016. 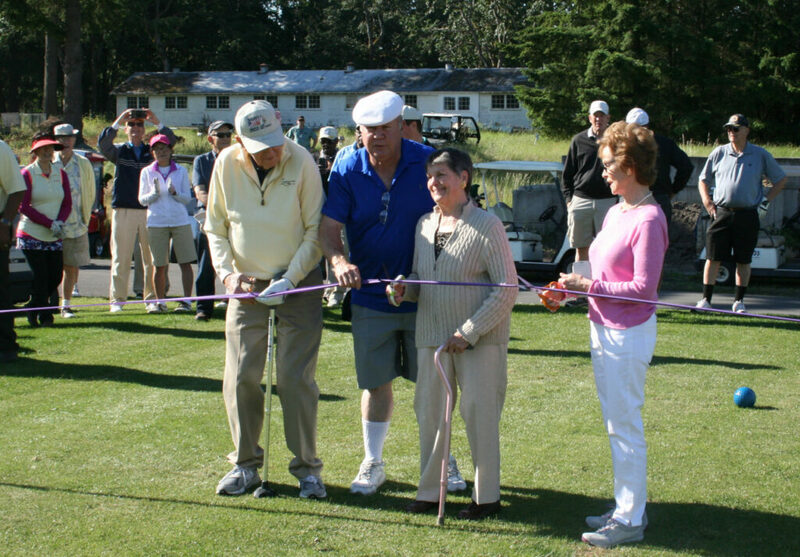 A ribbon cutting was held on the 10th tee featuring Ken Still, Assistant Course Manager Roger Gatts, and the Tatum sisters—whose father, Joe, cut the ribbon for the original nine. The nation’s only golf course designed specifically for facilitating the rehabilitation of wounded and disabled veterans officially doubled in size Saturday with the opening of the new “Nicklaus Nine” at American Lake Veterans Golf Course in Lakewood, Wash., just outside Tacoma. The Jack Nicklaus Signature Golf Course is the 400th Nicklaus Design to open worldwide since Jack Nicklaus embarked on his course design career in 1969. The Golden Bear donated his design services for American Lake Veterans Golf Course so that more of the nation’s veterans could experience the remarkable healing powers of golf. The “Nicklaus Nine” debuted during American Lake’s annual volunteer appreciation tournament. The grand opening featured a ceremonial ribbon-cutting by Joanne (Tatum) Hatner, whose father, Joe, was the director of the VA Hospital during the first ribbon-cutting ceremony for the course in 1957, an event she attended. “It is a therapy [for veterans] that is indescribable, until you are involved in it,” Hattner said. Following the ribbon cutting, Ken Still, 81, a former PGA TOUR professional and a teammate of the Golden Bear’s on the 1969 U.S. Ryder Cup team, hit the ceremonial first tee shot while representing his close friend as Nicklaus tended to responsibilities as founder and host of the Memorial Tournament presented by Nationwide, which also pays tribute to servicemen and women. Nicklaus visited the site several times to personally oversee construction and assess its progress, after Still involved him in the project. “Kenny called me, oh, I don’t know, six or seven years ago,” Nicklaus said, “and he told me, ‘Jack, I need your help. We’ve got nine holes of golf out here, and it’s playing 40,000 rounds a year. We need more golf.’ All these veterans, they’re unbelievable, and I want to help them. American Lake Veterans Golf Course is open to all veterans, their families and guests. This includes active duty, as well as retired military, National Guard and reserve members. The only non-veterans allowed to play are employees of the Veteran’s Administration. Anyone can also play as a guest of someone who qualifies. The importance of American Lake to our military men and women, and the importance it has in the game of golf, is not lost on the Golden Bear, and it was only fitting that a milestone for Nicklaus Design has become a stepping stone for accessible golf at military facilities nationwide. “I could not be happier that American Lake turned out to be Nicklaus Design’s milestone 400th golf course,” Nicklaus said. “Everything that American Lake stands for parallels our mission at Nicklaus Design, and that is to give people a place to recreate and congregate, and to design a course that best serves the needs of the people who play there. It’s been a labor of love to be involved in the planning, fundraising, groundbreaking and design of the Nicklaus Nine at American Lake. In March 2015, the Golden Bear received the Congressional Gold Medal, the highest honor the United States Congress can bestow on a civilian, becoming one of only seven athletes to receive the prestigious honor. A decade earlier, in 2005, Nicklaus was honored by President Bush at The White House with the Presidential Medal of Freedom, the highest honor the Office of the President can award any U.S. civilian. Nicklaus is one of only two golfers—and just the 17th individual—to receive both the Presidential Medal of Freedom and the Congressional Gold Medal. In addition, he was presented in 2013 with the Corporal Brock Bucklin Patriot Award from Folds of Honor for his unwavering support of military-related causes, such as K9s for Warriors, Combat Veterans to Careers, and Warrior Canine Connection, in addition to American Lake. American Lake marks the 297th golf course in which Jack Nicklaus has been involved, and these include 259 solo designs and 38 co-designs. Nicklaus’ first design project was Harbour Town Golf Links in Hilton Head, S.C., a co-design with Pete Dye that opened in 1969. Since then, no fewer than 140 Nicklaus Design courses have hosted close to 900 professional tournaments or significant national amateur championships worldwide. As many as 100 Nicklaus Design courses have appeared in various national and international Top-100 lists. Among his numerous course design honors, Nicklaus was recognized most recently as Architect of the Year by Golf Magazine for 2014. Nicklaus Design had three out of five global finalists in Golf Inc.’s 2016 “Renovation of the Year” Contest. The firm currently has projects under construction or under development in 22 different countries. There are now 400 Nicklaus Design golf courses located in 41 countries and 39 states. American Lake is located at 9600 Veterans Drive S.W., Lakewood, Wash. For more information about the course, visit veterangolf.org or call 253-589-1998.